McCain: Hi Mathew, Thanks for talking with us. Let’s get started at the beginning; How did you get into being a chef? 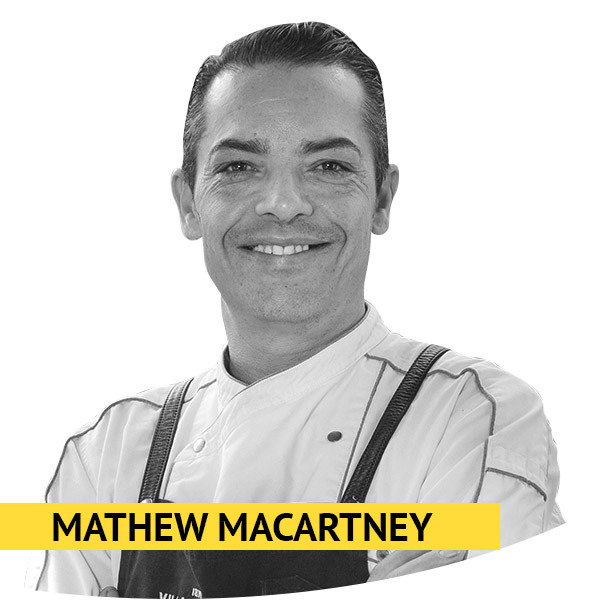 Mathew: My career began at The Snooty Fox, a quaint little restaurant on the famous Dandenong Tourist Road. From there it was all up, securing a position at the iconic Café Cuccina in Melbourne’s trendy South Yarra to Hotel Sofitel. My experience there, under the direction of Raymond Capaldi and Marcus Moore, is the best training any young chef could get! From there it was off to Daylesford’s award-winning Lake House as Head Chef before the opportunity presented itself to lead the kitchen at Chateau Yering where I held a string of Chefs Hats for several years. I feel like I have achieved everything I’ve wanted to as a fine dining chef and I’m now excited to take up this new challenge at Village Belle. Good food and quality produce is front and centre of our menus. McCain: What is your most popular dish on the menu? Mathew: Hands down, the Parmigiana. We’ve now extended our Parma offering to 4 options and feature 2 house favourites and 2 rotating weekly specials. It’s now become a competition in the kitchen. Two chefs compete for bragging rights and come up with different Parma specials each week. McCain: What do you believe makes a great chef? Mathew: The best chefs know that a well-oiled kitchen takes the entire team. Respecting mentorship and guidance so that everyone can perform at optimum levels are critical to a great kitchen brigade. McCain: What do you believe makes your establishment successful? Mathew: We have a great team around us! The 4 boys who own Village Belle have so much energy and are very passionate about the pub. We have everything you could hope for in a venue. There’s an indoor-outdoor feel with light streaming in from many angles. I also bring a unique perspective to the kitchen with my culinary background. McCain: You currently have our McCain Beer Batter Steak Fries on your menu. What made you select these fries for the venue? Mathew: Quality and consistency. The boys who own this pub, are very particular on their chips. Prior to the renovations and before my time, they changed the brand of chips and customers complained. As soon I started here, we tested an array of chips and we immediately fell in love with the McCain Beer Batter Steak fries. Since opening, we’ve had many compliments on the chips. As mentioned, Parma’s being our most popular dish, we wanted to make sure we selected a quality fry that complimented the dish and McCain Beer Batter Steak fries have been a success. We have a chest freezer out the back that’s dedicated to McCain fries. We sell 30-40 cartons of chips per week. McCain: Have you experimented with different flavoured salts and sauces with your fries? And if so, what were the results and feedback like? Mathew: Yes, I currently have my own signature seasoning on the McCain Beer Batter Steak Fries. It’s a secret, but I can tell you my secret ingredient is Togarashi, a Japanese pepper and our customers love it. We also serve our fries with multiple dipping sauces including aioli, tomato sauce and we’re about to introduce a nacho cheese sauce to the line-up. McCain: We noticed a few sharing items scattered across your menus, what’s the reason for this? Mathew: We encourage groups to come to the Village Belle and order a few bottles of wine, a charcuterie plate or cheese plate and graze for a few hours. We find that our snacking menu is popular especially on the weekends and especially on a beautiful sunny day. McCain: What do your customers want in terms of fries? Mathew: Customers want crunch, internal fluffiness and consistency. We also make our own flavoured salt which compliments the fries. McCain: How do you get inspirations for your menus? Mathew: I’m fortunate to have a Teledex of flavours and recipes drawn over the last 30 years. Ultimately, menu decisions are driven by the seasons. Our menu development begins 2 months leading into each season, and we work very closely with our suppliers. Within each season we choose to highlight a hero element. For spring – lamb, asparagus and broad beans are found on our menus. In autumn, it’s all about the varieties of mushrooms and the humble tomato soak up the spotlight for summer. McCain: Do your menus change for special events? Mathew: We strategically curate grazing menus for all our events at the restaurant. It’s cost effective from a food and labour cost perspective. These sharing menus alleviate pressure from our floor staff and kitchen team when the restaurant is at capacity. Some of the risk associated with a la carte service is also removed with a sharing style menu. I can even plan and budget well in advance knowing the number of reservations and having clarity around what everyone is eating.